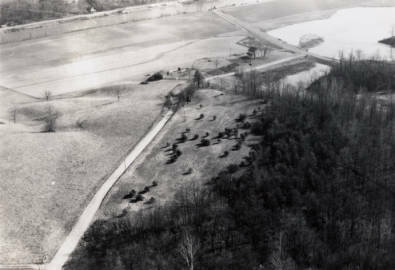 This photograph gives an aerial view of the site on which Fort Gower was built in 1774. The fort was built by soldiers returning from Lord Dunmore's War, a conflict that arose with area American Indians after colonists continued to disobey the Proclamation of 1763 and settle in Ohio territory. It is also the site of the writing of the Fort Gower Resolutions. The site is downstream from Hockingport, Ohio, in Athens County. On February 10, 1763, representatives from various American Indian tribes, as well as British, French, and Spanish leaders, met to negotiate the Treaty of Paris, which ended the French and Indian War (1754-1763). As outlined in the treaty, France gave up their lands in North America and handed them over to the British, including American Indian lands in the Ohio Country. Following the signing of the treaty, American Indian tribes living in the Great Lakes region immediately rose up against the British for fear that they would settle their lands and push them west. In response to their growing frustration, many tribes congregated under the leadership of the Ottawa chief, Pontiac. During a campaign referred to as Pontiac’s Rebellion, American Indians of the Ohio Country and Great Lakes region fought to push colonial settlers off Native lands into the regions east of the Appalachian Mountains. The British monarchy decided to address the conflict by developing legislation that would subdue the fighting. On October 7, 1763, the British Board of Trade under approval of King George III issued the Proclamation of 1763. This Proclamation established a variety of limiting legislature in regards to interaction with the American Indians, boundaries for territories, and governmental responsibility. The Proclamation Line, a component of the Proclamation itself, established the geographical limitations of colonial settlement. Any land that resided west of the Appalachian Mountains, from the southern area of the Hudson Bay to the region north of Florida were to be preserved for American Indian territories. The Proclamation prohibited colonists from settling west of the Appalachian Mountains, and those who settled the region previously, were required to relocate east of the colonial divide. Since these lands were gained by Great Britain by defeating France in the French and Indian War, the British monarchy controlled all former French territories, including American Indian lands. However, to reduce friction, the American Indian lands were to be controlled by American Indian law and cultural policy with no interference from the colonial government. Colonists were also barred from having any interaction with the people who resided within the American Indian lands; trading between the two groups was no longer permitted. With the restriction of colonists solely to the inner, eastern coastlines the colonial government would now have an easier time to successfully execute and regulate taxing burdens on the citizenry; a noted strategy by the government to ease their way out of wartime debt. Overall, the Proclamation of 1763 disbanded colonial ambition to expand into the westward frontier. The Proclamation of 1763 also founded four new colonies that were obtained in the aftermath of the French and Indian War; Quebec, West Florida, East Florida, and Grenada. Boundaries were set to define the stretch of each colony while also establishing local governments to manage the different regions. Colonists were unnerved by this Proclamation because it inhibited their desire to expand their settlements, concluding that due to Great Britain's victory there was an unspoken right to the lands now allocated for American Indian reservations. The Proclamation did not prevent colonists from continuing their pursuit of new land, as many disregarded the provisions and continued their journey toward westward settlements. American Indians were displeased with the colonists' blatant violation of the Proclamation and conflict continued. Finally, the Proclamation also heightened the colonists’ dissatisfaction with British rule. They did not appreciate the restriction of their travels or the trade limitations as outlined in the Proclamation. Eventually, paired with the various economic acts that the British government would come to pass to eliminate their growing debt, the Proclamation fueled tensions between the British monarchy and the colonists, thus leading to the development of the American Revolution.